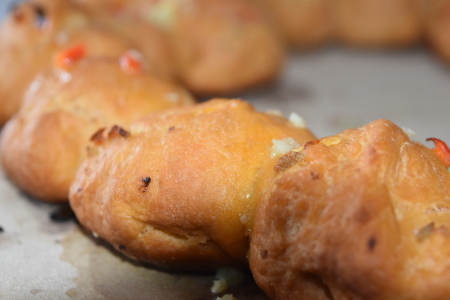 This Smoky Chilli Garlic Bread is sure to impress your guests. Not only does it have the universal appeal of being garlic bread, but it has that delicious kick of the chilli combined with the rich smokiness of the maple smoke pellets. And of course, homemade bread just tastes great. This is another recipe where it’s essential to have a barbecue with a lid, preferably ceramic. Cooking bread like this necessitates an oven environment, which you can create with heat deflector stones between the charcoal and the grill. A 2nd tier grill is also useful to raise the bread as far up from the charcoal beneath it as possible. 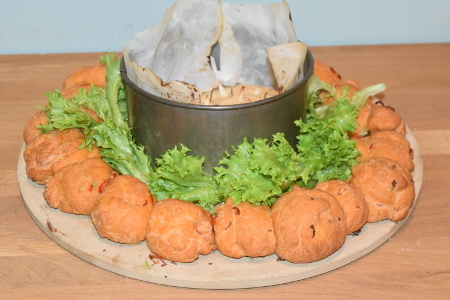 The best way I’ve found to cook this bread is using a pizza stone – this gives you an appetising looking ring of bread, giving space for you to put dips or maybe even a Vegan Camembert in the middle. Serves 6. Prep time: 45 minutes. Proving time: 1 hour. Cooking time: 30 minutes. Start by mixing the flour, yeast, salt and smoked paprika together in bowl – I advise using a whisk to mix them to make sure that the paprika is distributed evenly throughout the flour. Push the flour mixture to the sides of the bowl to form a well, then pour in the tepid water slowly, mixing it into the flour as you go. Keep mixing in the water until you form a soft, but not gooey, dough. If the dough seems a little dry, feel free to add a bit more water; if it seems a little gooey, add a bit more flour. 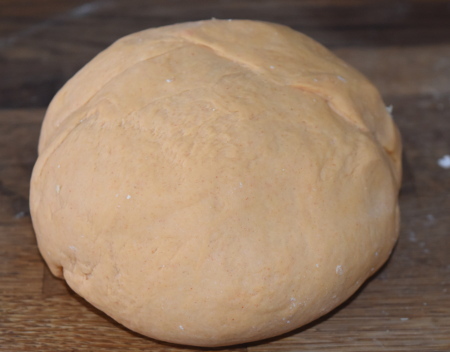 Put the dough onto floured surface and knead for 10 minutes, until the dough is lovely and stretchy. By this point you should also be able to see the gorgeous orange colour of the paprika throughout the dough. Put the dough into a large bowl and cover it with a damp tea towel. Leave to prove in warm place for 1 hour or until doubled in size. While you’re waiting for the dough to prove, soften the vegan butter. Mix together the chilli, garlic, lemon juice and butter in a bowl to make your garlic chilli butter. If you have a pizza stone, lightly flour it in preparation for cooking your smoky chilli garlic bread. If not, line a baking tray. Light your barbecue and place the heat deflector stones and grills inside it, before heating it to 190°C (374°F). 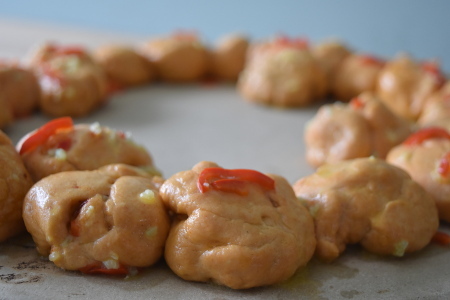 After an hour, take out the dough and separate it into little balls – I made 24 out of one batch of dough. Coat the balls in the chill garlic butter and arrange them in a ring on the pizza stone, or into rows in your tray. Feel free to put a bit of extra garlic butter on top, but remember to leave some spare for topping the bread after it’s cooked. Place the pizza stone/baking tray of dough onto the barbecue grill, closing the lid immediately after to keep the heat in. Straight after, add the smoke pellets to hot barbecue coals – this is extra easy if you’re using a chip feeder system, found on the Monolith ceramic barbecue. If you don’t have a Monolith, you may have to add the smoke chips just before putting your bread on to cook. Cook the bread for 30 minutes. Take out your smoky chilli garlic bread, and brush the leftover garlic butter on the top to give it a lovely shine before serving. I recommend serving your Smoky Chilli Garlic Bread with a Vegan Camembert – this bread really is perfect for dipping.